universal part // T-shirt Racing Planet "Sensu Crew Edition"
From the current Racing Planet T-shirt collection we have the 'Sensu Crew Edition'. 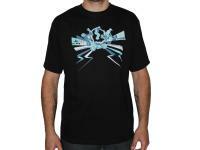 Black T-shirt with Sensu Crew graphic check print in white, turquoise and blue. These t-shirts come up a little bigger so we would recommend ordering the size down from your usual size unless you like a loose wear.